The Fingerprint Resistant Stainless Steel exterior keeps this Maytag. french door refrigerator looking as good on the outside as it works on the inside.The PowerCold. feature brings the temperature down with the touch of a button and BrightSeries LED lighting makes finding favorites easy. The Strongbox hinge design helps seal in cold air and the 10-year limited parts warranty on the compressor provides peace of mind that this Fingerprint Resistant Stainless Steel refrigerator is made to last. The GNE29GGKWW 28.5 cu. ft. French-Door Refrigerator offers an array of features for your convenience including an in-door water filter, and FrostGuard defrost technology. It also features Showcase LED lighting, positioned throughout the interior and under fresh food doors to spotlight foods inside both the refrigerator and freezer. And with GE's exclusive Pure and Clean Filtration system, you have the peace of mind that your water is fresh and clean. This LG 3-door refrigerator boasts an impressive 28 cu. ft. capacity to store more food and comes loaded with features to help keep it all fresh. Combined with the smart cooling system enabled by LG's exclusive Inverter Linear Compressor, your food will stay fresher, longer. You'll also enjoy the high efficiency and quiet operation that is more energy efficient than a conventional compressor and is backed with a 10-year warranty. With all of this and more, this is a perfect addition to your home. 36-Inch W 27 cu.ft. 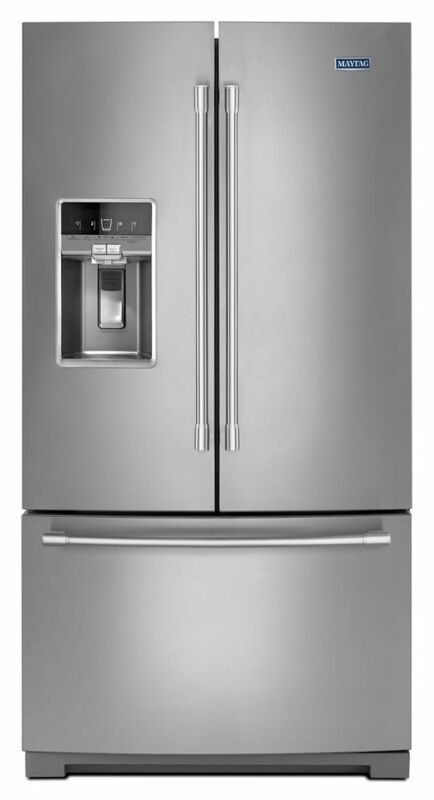 French Door Refrigerator in Stainless Steel The Fingerprint Resistant Stainless Steel exterior keeps this Maytag. french door refrigerator looking as good on the outside as it works on the inside.The PowerCold. feature brings the temperature down with the touch of a button and BrightSeries LED lighting makes finding favorites easy. The Strongbox hinge design helps seal in cold air and the 10-year limited parts warranty on the compressor provides peace of mind that this Fingerprint Resistant Stainless Steel refrigerator is made to last.